DOVER AIR FORCE BASE, Del. (AFNS) -- Airmen are testing a new inspection program here that will not only save the Air Force $1.38 billion over the next two decades, but also will keep four extra C-5 Galaxy aircraft available every day for air mobility efforts. The new program, which will change the way the Air Force conducts C-5 inspections, is part of an Air Force Smart Operations for the 21st century initiative held at Dover Air Force Base in cooperation with Airmen from Stewart Air National Guard Base, N.Y. 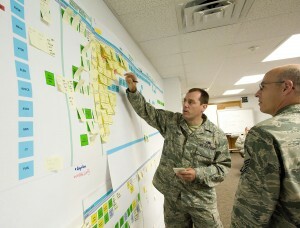 According to Dover AFB officials, Airmen from Stewart ANGB participated in the rapid improvement event because the Guard and Reserve will play a large part in the new inspection process. "This new type of inspection concept completely replaces the traditional legacy isochronal inspection program," said Master Sgt. Robert Diresta of the 105th Maintenance Squadron. The previous inspection cycle called for C-5 aircraft to go to Warner Robbins Air Logistics Center at Robins Air Force Base, Ga. for a complete overhaul every five years and each base performed its own minor inspections. Once at Warner Robbins ALC, Airmen took apart and reassembled the aircraft looking for any structural issues or damage to parts. "The new inspection process moves the dates the aircraft would go to Warner Robbins Air Logistics Center ... from every five years to every eight years," Sergeant Diresta said. "Guard and Reserve bases will conduct all the minor inspections, and Dover AFB Airmen will conduct a major inspection for every C-5 aircraft in the Air Force." The inspection period for the C-5 aircraft will be divided into 16-month increments. "Every 16 months the C-5 aircraft has to go through inspections," said 1st Lt. Jeffrey Fry, the 436th Maintenance Group AFSO 21 officer. "The first two are minor inspections and will be done at Guard and Reserve bases. The third is a major inspection and will occur at Dover. Then there will be two more minor inspections and, at the eighth year, the aircraft will go to Warner Robins for a complete overhaul." With the current number of C-5 aircraft in the fleet, the AFSO 21 team determined the base would have only 28 days to completely inspect a single aircraft. "We validated and verified this new way of doing the major inspections," said Capt. Edward DeFalcon of the 105th MXS. "We’ve lived through this already, so we’re here to share our best practices and help Dover learn from our mistakes and make sure everything goes smoothly. We’re making history here. We’re crossing major commands and working with Guard, Reserve and active duty to make a fleet-wide change." If successful, the new program has the potential to change the way inspections are conducted Air Force-wide. "If this new program is successful, it’s very possible that we could change all [Air Force] aircraft over to this type of inspection," said Senior Master Sgt. Robert Pritchard of the 105th MXS. "The idea to standardize everything across the fleet just makes sense." The first major inspection under the new program is scheduled for Aug. 9 at Dover AFB.